This unique Italian Renaissance-styled three-story house was built in 1918. The hipped green ceramic tile roof, detailed first-floor windows, and symmetrical façade are high style hallmarks. James L. and Jane Quigley Canale purchased Lot 31, address 549 South Belvedere Boulevard, in 1915. Construction of this house was completed in 1918. James Canale lived here until his death in 1928. The homeowners have made extensive renovations, including an incredible second-floor master suite that includes a large walk-in closet, a master bath with refrigerator, and a separate living area that was a formerly a porch. There is a lovely view of the garden from the kitchen. The breakfast area has a custom-made banquet for seating. The builder and first owner of this handsome 1909 Mission-style house was Charles Boyle, who co-developed Belvedere Boulevard Subdivision with his brother, Edward. Charles Boyle intended this home to be the vanguard of quality for homes to be built on South Belvedere Boulevard. It was a model for potential new neighbors! This home is considered Mission Style, as seen in the character of the three arched windows above the entrance. After constructing this home in 1909, Charles Boyle sold it to Henry T. and Arabella Winkelman in 1914. Charles moved to the Claridge Hotel and later was listed as a resident of the Peabody Hotel at the time of death in 1936. This c. 1911 residence is a great example of the popular Colonial Revival subtype known as the Classic Box, which comprised a third of all Colonial Revival house built before 1915. The current homeowners have made extensive renovations. In 2017, while not changing the footprint of the house, a stunning kitchen, designed by the architect David Schuermann, was built. There is a new screened porch in back and a courtyard with a fountain next to the guesthouse. The original builder of the home was Edward M. Ford who was affiliated with the Baker Lumber Co. of Turrell, Arkansas which sprang up around timber-cutting operations owned by Wisconsin native Fletcher E. Turrell. 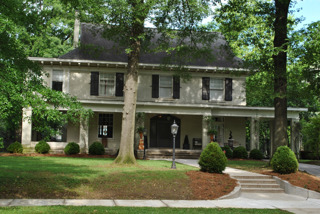 In 1959, the house was purchased by Dr. Iris Annette Pearce. Pearce attended Rhodes College (Southwestern) in the 1940s, and graduated from Vanderbilt University. During World War II, she joined the Women’s Corps of the U.S. Naval Reserve. Iris Pearce was one of two women in her class to graduate from the University of Tennessee Medical School in 1950; she served as the first female internal medicine resident at John Gaston Hospital (now The Regional Medical Health Center) and became the first woman to serve as its medical director. 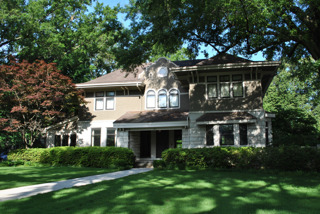 The first owner of this home was Felix T. Pope, who was born in Louisiana in 1874, and moved to Memphis in 1886. The socially prominent Mr. Pope owned the Merchant’s Trust Bank and developed real estate. In 1900, he founded the Pope Land Company and developed a subdivision bounded by Lamar, Rozelle, and Evelyn. Felix Avenue is named for him. This cast stone clad Colonial Revival house has been beautifully renovated by the current owners, who purchased the home in 2002. The renovations include a new kitchen, great room as well as a downstairs hallway leading to a new master bedroom and bath. Off the great room is an L-shaped screened in porch which overlooks the professionally landscaped yard. This c. 1915 residence is an excellent example of a side-gabled Colonial Revival house (1880-1955). 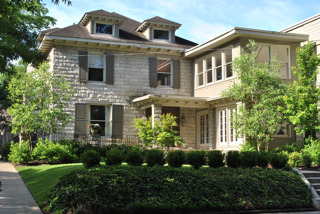 The home underwent a lengthy total renovation by Hamilton & Holliman in 2015. While the home is Colonial Revival, it has touches of art deco, especially the wooden circles at the front door entrance. The homeowners have taken the renovation a step further by making their home a smart house. Technology controls the lights, doors, gate, and security. The original owner was Alfred Lewis Aydelott. 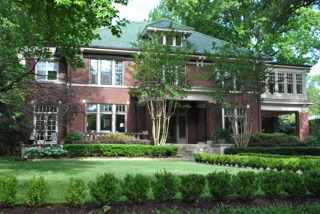 Aydelott was the grandfather of his namesake, Memphis’ great Modernist architect A. L. Aydelott. The senior Aydelott was residing here when he died in November 1915. His widow rented the property to Waring A. Black, a cotton broker and owner of The Dyersburg Cotton Co. Black and his family lived here until the mid-1920s. 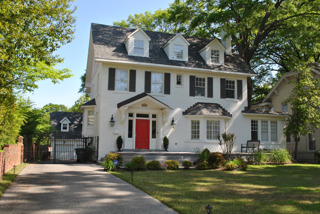 Adjacent to Belvedere Boulevard, is 1717 Glenwood Place, a 1907 Colonial Revival home. In the early 1920’s the homeowners added two front-of-the-house sunrooms with solid walls on the west side, one on the first floor and the other on the second, to block the view of the apartments that were built in 1921. After a sensitive renovation of the house was completed, Amanda and Scott Harkins purchased this home in 2015. Robin Redd of Redd Kirk Design Studio was the designer. The light-filled kitchen features Viking appliances and soapstone countertops. The homeowners added a screened porch off the kitchen, a stone patio with built-in grill, and a new garage. The first owner of this home was Grecian immigrant Pantelis Panagiotopoulos, and wife Mary. Pantelis was from Aigio, Greece. 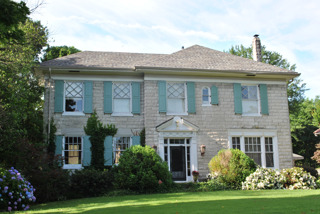 Paul and Katharine McDonnell bought the home in 1937. Upon returning from World War I, Paul founded McDonnell Insurance in 1919. During World War II, the McDonnell family planted a Victory Garden in the backyard that had corn, string beans, and other vegetables. Katherine McDonnell had a reputation as a wonderful cook. She and Paul had seven children and 48 grandchildren.